Use our Interac e-Transfer service to make a fast payment to your personal loan. The correct mailbox for your Province. Please follow the instructions below to use this payment method or get in touch with us for any questions. Login to your online banking and find the Interac e-Transfer option. If you need help, please contact your bank and they will be happy to help! Security question*: Who do I have a loan with? *If your bank supports Interac auto deposit you will not be prompted for a security question. After your payment is sent you'll receive an e-receipt in your inbox with confirmation that your payment has been sent to us. Once deposited you will also get an Interac notification. This may happen immediately if your bank supports auto deposit. After this, nothing else is required on your behalf! We'll process your payment and apply it to your account. If you do not receive a confirmation that your deposit has been made contact us immediately to ensure your payment was sent with correct details. Oops, you received a notification from Interac that the e-Transfer has not been deposited, or it has been deposited and not reflected in your MyAccount. No problem! We have included some areas below that might be a problem. If any of these apply to your situation, please get in touch with us so we can troubleshoot the issue. Include your loan number in the notes/comments or message section of the transfer. This will help us identify you even faster. If you're unsure what your current loan number is, just ask us. 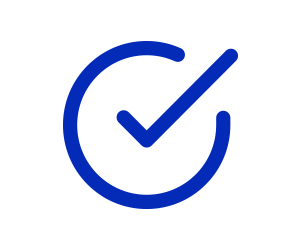 Ensure that your contact information with your bank (including your name and email address) is the same as you've used on your Ferratum MyAccount. 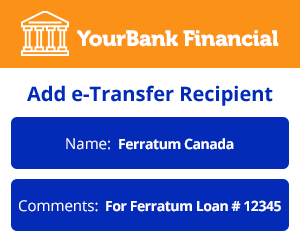 Ensure the Ferratum mailbox you've sent payment to is the same as the Province you resided in when you received the loan. If you have recently moved, our records may not reflect this change. If we are unable to allocate your payment, we will contact you using the details you gave us on your loan application. 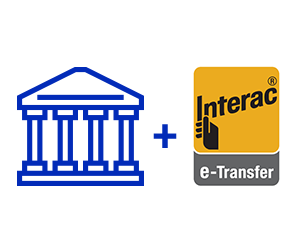 If you need more information regarding the Interac e-Transfer process, we recommend watching the short video below.